Deus Ex Machina is a bona fide institution in the Alt.Custom world. Founded in Australia as a conceptual project celebrating multiple subcultures (custom motorcycles, surfing, skateboarding), Deus uses a brilliant graphic identity to celebrate what’s cool. The timing of Deus’s arrival was impeccably matched to the rise of the Alt.Custom scene that was busy rediscovering how motorcycles could be fun again, and their initial outpost in Sydney grew three more branches; in Venice (California), Bali, and Milan. At their Venice “Emporium of Postmodern activities,” Design Director Michael “Woolie” Woolaway builds Deus’s signature custom motorcycles. The “Ago TT” is Woolaway’s homage to Giacomo Agostini and his amazing record of wins at the Isle of Man TT, considered the ultimate road race for its complication, length, and danger. The “Ago TT” is built around a nearly new MV Agusta Brutale 800 RR, an already outrageous “naked” sportbike with minimal bodywork, and as the name suggests, brutal performance. To link this new MV with past glory, Woolaway clad it in handmade aluminum bodywork that closely recalls the sensual, body-hugging MV GP tanks of the 1960s and ‘70s, built by Primo Selotti. The black exhaust pipes echo the sweeping megaphone exhausts of multi-cylinder MV Agusta GP racers that were later offered as roadster options by former MV race chief Arturo Magni. 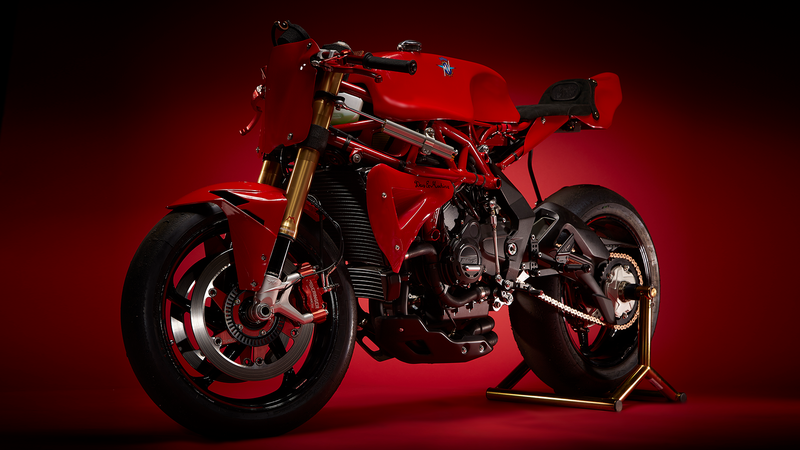 Taken together, these historic visual cues wrapped around a contemporary sports-racer create a stunning motorcycle that convincingly combines the best of new technology with the incredibly rich and romantic history of a legendary Italian brand. The “Ago TT” has been featured in PipeBurn, Uncrate, Highsnobiety, Silodrome, and Gearheads.